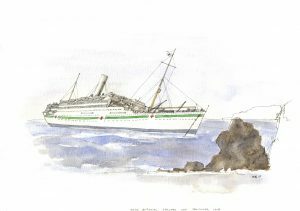 100 years ago today (09/11/1916), 24 year old 2nd Lieutenant John Ronald Reuel Tolkien arrived in Southampton, one of the hundreds of wounded and ill servicemen returning home aboard the Hospital Ship Asturias. 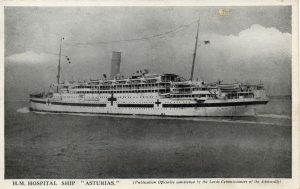 The Asturias was the third hospital ship to arrive in Southampton that day, the majority of injured coming fresh from the battles raging on the Somme. Tolkien had fought on the Somme and evaded injury, but four months of living in lice infested trenches had resulted in Trench Fever. 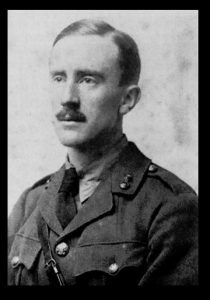 Tolkien was taken by ambulance train from the battlefield to a hospital in Le Touquet where he remained for a week, but when his condition worsened he was ordered back to Blighty, sailing from Le Havre. On arrival in Southampton, ambulance trains were waiting to transport the patients to hospitals around the country, as close as possible to their home towns. Tolkien was put on a train bound for Birmingham where he would be reunited with his wife (whom he had barely seen since their wedding the year before). So efficient was the wartime transport system, that this whole journey was completed in a single day. Tolkien spent the remainder of the war between hospital and Home Service camps. Although unable to fully shake off the illness, the lice probably saved his life, as following his departure, the remainder of his battalion, 11th Battalion Lancashire Fusiliers, 74th Brigade, were sent to Ypres where they were almost completely wiped out.